Sorry, but just got too busy this week, so no new post. 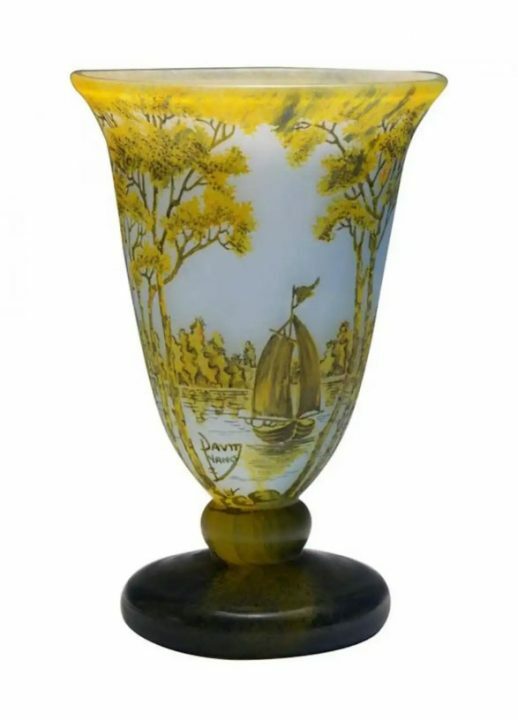 I search online from time to time to see what’s being offered for sale, including French cameo glass. Somewhat unsurprisingly, a large percentage of it is either authentic, but low quality, or authentic and cut down, or reproduction. How is a novice supposed to tell? The simple answer is that a novice cannot tell. Here are a few examples from this week’s listings. Grogan & Co. is a reputable auction house from Boston, Mass. 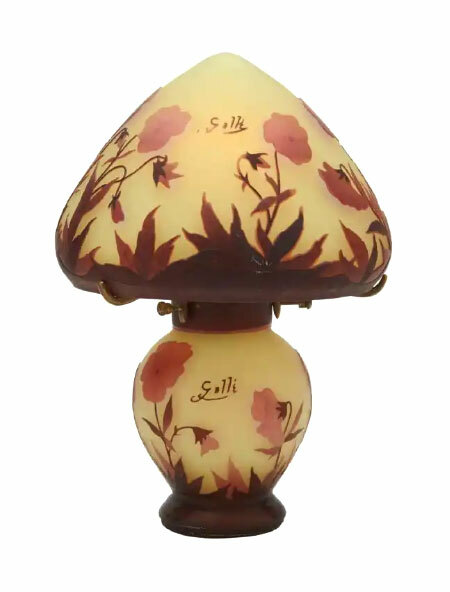 They listed two lamps for their May 5th sale, lots 274 and 275, as authentic Gallé, when in fact they were modern reproductions. As of this writing, they were still listed for sale on liveauctioneers, but not on their own website. They found out the items were reproductions and they removed them from the sale. That’s what a reputable auction house is supposed to do. 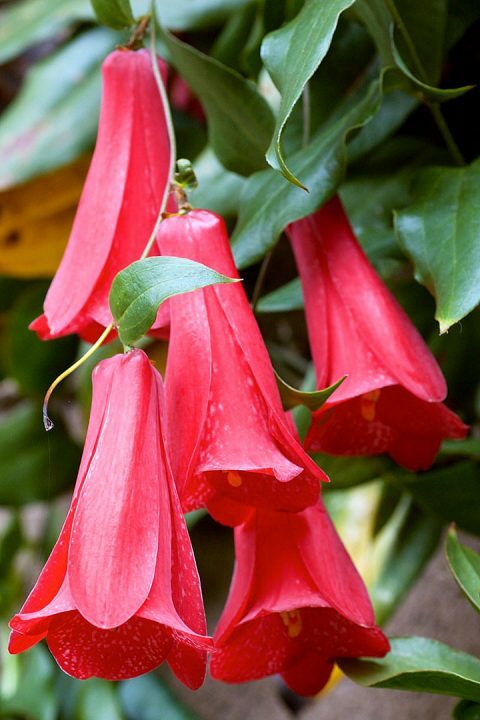 How about the vase pictured above? It’s on liveauctioneers advertised as SIGNED EMILLE GALLE FLORAL DESIGN BOWL by Redlands Antique Auction of Redlands, CA. Technically they’re correct. It is a floral design bowl and it is signed Gallé (not counting the misspelling of Emile), but it isn’t old. I don’t know the auctioneers from a hole in the wall, so I have no idea if they’re uninformed or sinister. A novice would have no idea about the authenticity or age of this bowl. It’s actually a pretty good repro. It’s painful for me to look at the reproduction Daum Nancy vase pictured above. It’s soooo bad. But Washington Crossing Fine Arts and Antiques, Washington Crossing, PA, think enough of it to offer it for sale on liveauctioneers with an estimate of $1,800 – $2,000. There’s a sucker born every minute (possibly said by P.T. Barnum). Even if he didn’t say it, it’s true. Make sure you’re not one of them. 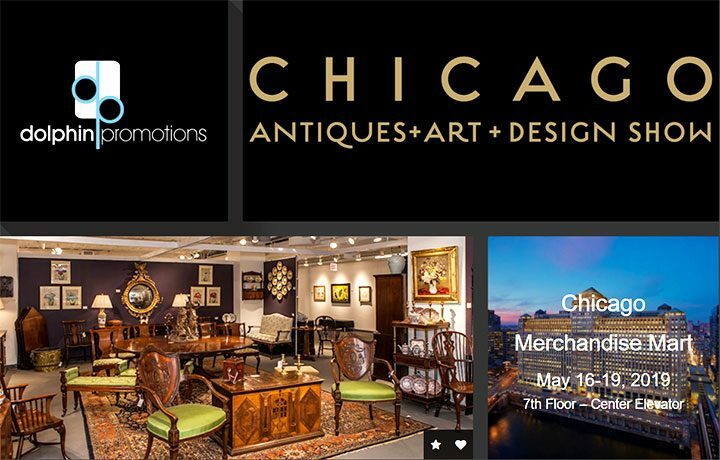 Buy only from reputable dealers and auction houses, even if it costs a few bucks more. At least you’ll be able to sleep well at night. 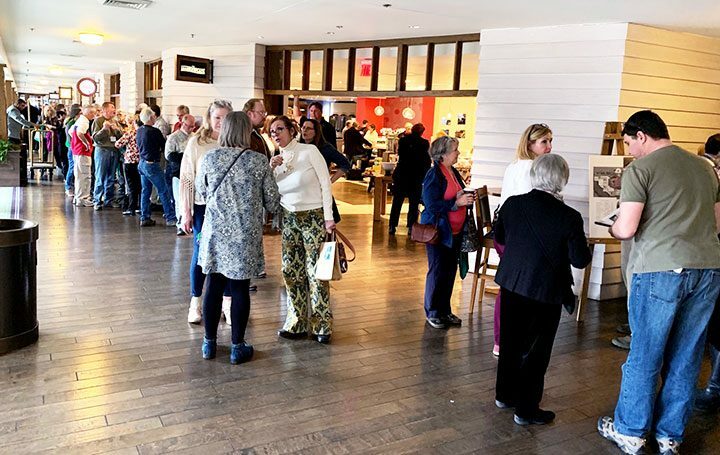 Treadway Gallery, Cincinnati, Ohio, held a Spring 2019 Art+Design auction yesterday, April 7, 2019. 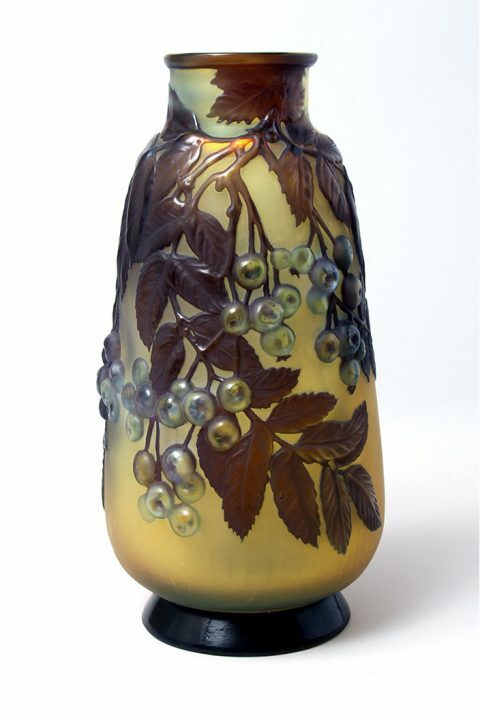 Included in the sale was a collection of French cameo glass, as well as a number of Tiffany Studios’ items — the subject of today’s post. 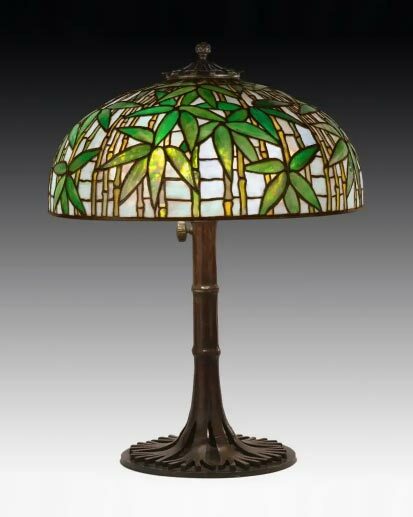 The top Tiffany Studios item of the sale, lot #4, a 20″ diameter Daffodil table lamp, sold for $43,750, including buyer’s premium. The result was below the estimated price of $40,000 – $60,000. 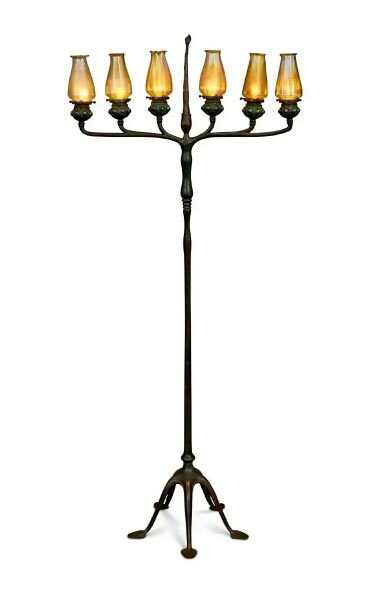 The second-best performing Tiffany Studios lot in the sale was #31, a rare 6-light floor candelabrum. It too sold below its estimate, realizing $26,250, including buyer’s premium. Its estimate was $30,000-$40,000. The French cameo glass, mostly from a single Los Angeles collection, fared better. 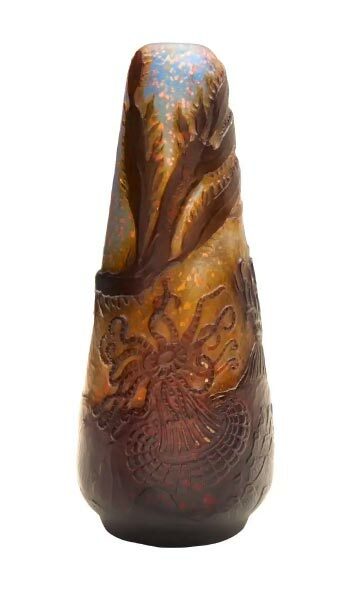 I tried to buy lot #37, a beautiful Gallé wheel-carved Marine vase. Estimated to sell for $7,500 – $9,500, it realized $17,500, including buyer’s premium. I was the underbidder. Cottone Auctions held a Fine Art & Antiques sale yesterday, March 23, 2019. 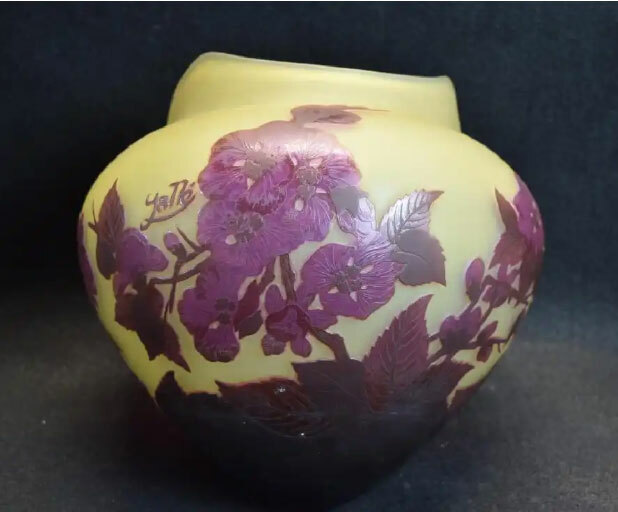 Included in the sale was a nice selection of Tiffany Studios lamps and glass and one very nice Daum Nancy vase. Following is a review of those items. 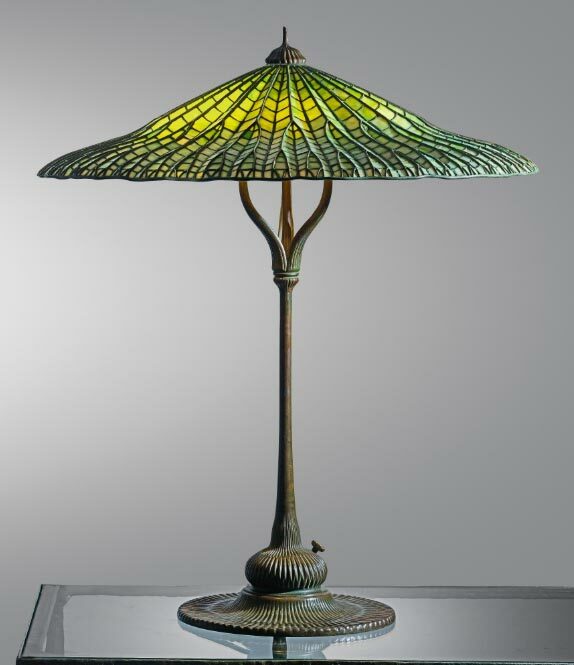 A Tiffany Studios 22″ diameter Bamboo table lamp, lot #55, sold a little below its estimate of $75,000 – $125,000, realizing $85,550, including buyer’s premium. The result appeared weak, as bamboo lamps have sold for considerably more at the major NYC auction houses. 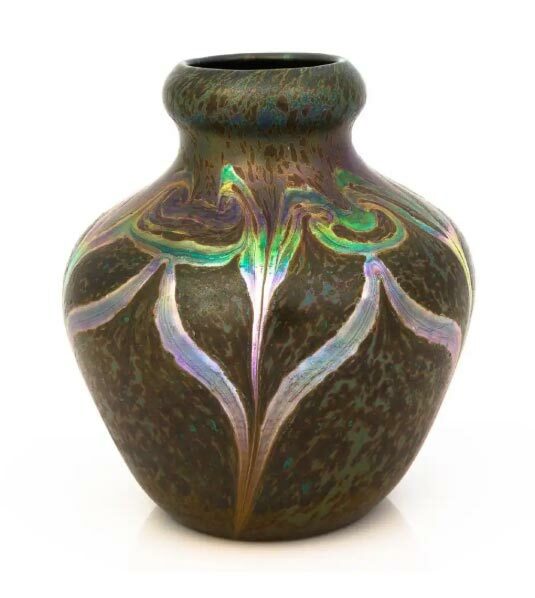 A very nice Tiffany Studios 9″ Favrile Cypriote vase, lot #58, sold for a good price, within its estimate of $20,000 – $40,000, realizing $36,580, including buyer’s premium. 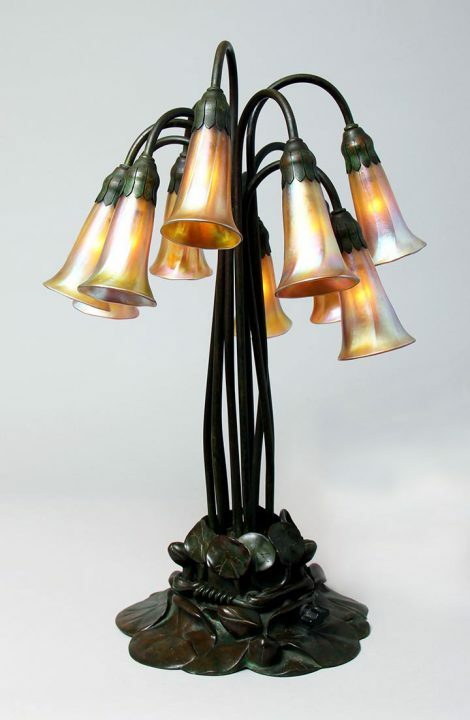 Other Tiffany Studios objects did well. A very fine 7″ deep blue Favrile lamp sold for $16,520 (lot #59); an unusual 14″ diameter Arrowroot table lamp sold for $61,950 (lot #60); and a red Art Deco desk set sold for $15,930 (lot #70). 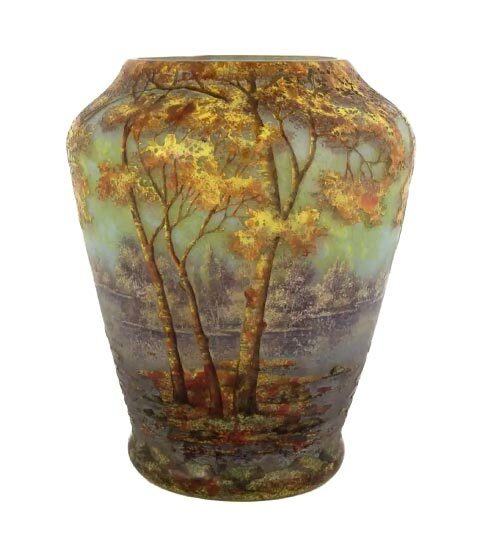 There was only one Daum Nancy vase in the sale, but it was a good one — a nice Fall scenic, 9¾” tall. It sold within its estimated range of $7,000 – $10,000, realizing $10,620, including buyer’s premium. 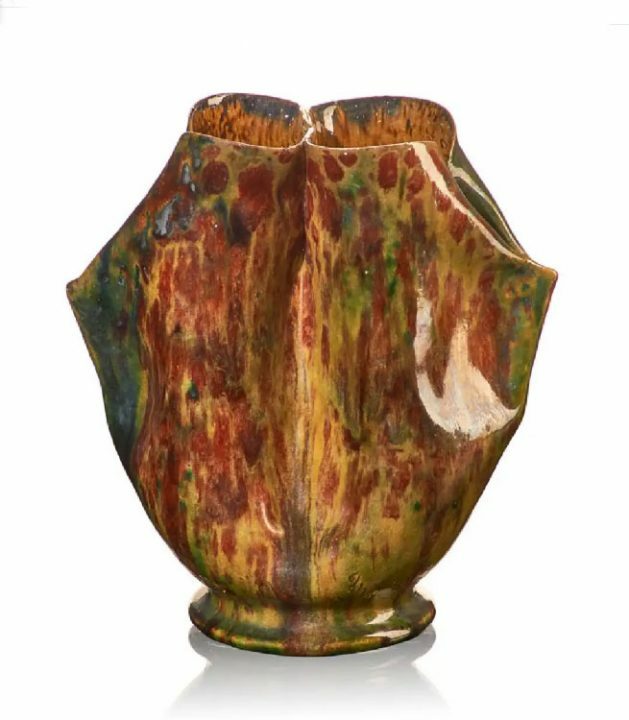 Unfortunately I was unprepared to bid at the auction because we had just returned from vacation, but I probably would not have bought this vase as the price was a bit too high for a dealer. The complete results can be found by clicking here. You will have to sign into LiveAuctioneers to see the prices. No new post this Monday. We’re on vacation. 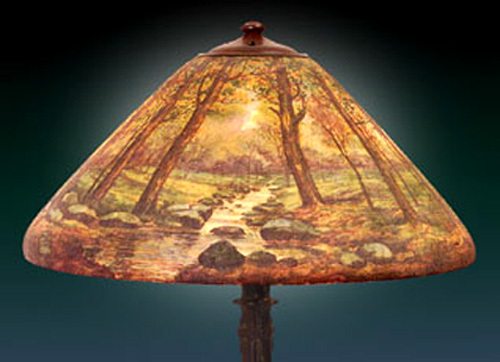 It’s not often that Tiffany Studios lamps are sold at auction in Europe. 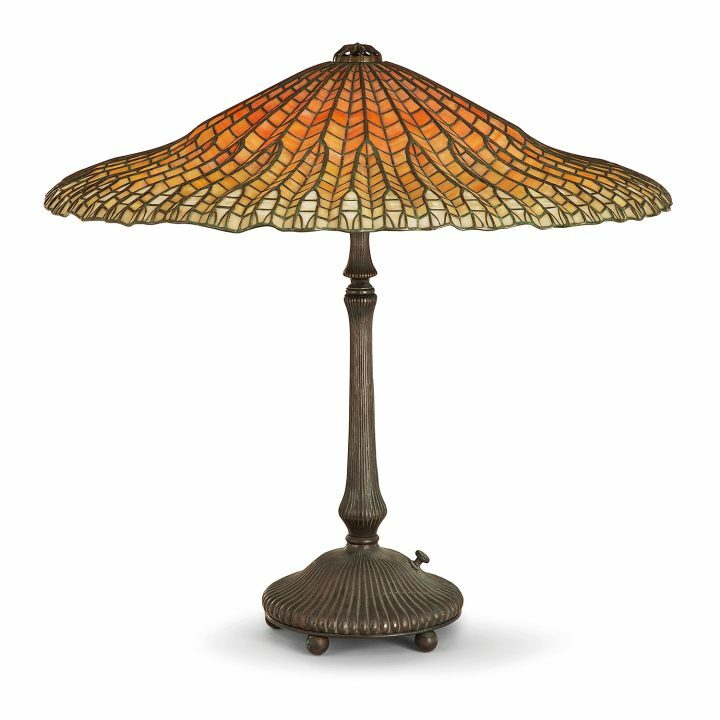 So I was surprised that a French auction house, Tajan, was selling one, a Tiffany Lotus lamp, at their sale in Paris last November 20, 2018. The final sale price of €93,600 ($106,122), including buyer’s premium, easily exceeded the pre-sale estimate of €40,000 – €60,000. But was it a good price compared to what it might have brought if it had sold at a major American auction house? Not if you look at the result of a fairly recent Sotheby’s New York sale, Tiffany: Dreaming in Glass, December 13, 2017. A green example sold for $375,000, against a pre-sale estimate of $120,000 – $180,000. So the way I see it, one of two things happened. Either someone got a great deal on an authentic lamp or got ripped off on a reproduction. I wasn’t there to inspect the lamp, so I have no idea. I can only hope it was the former. 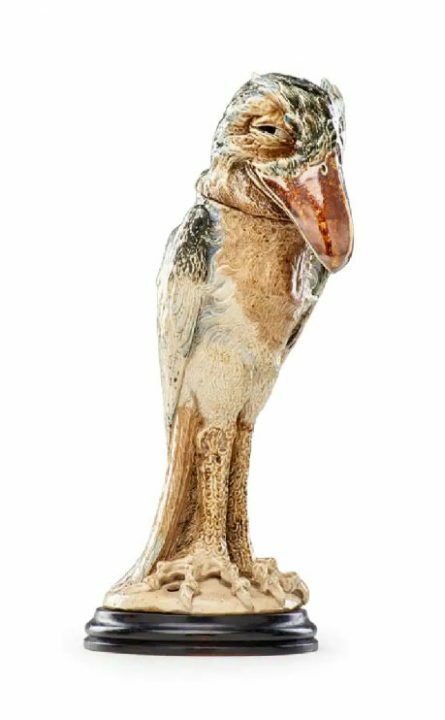 Rago Auctions held an Early 20th C. Design sale on January 19, 2019. Included in the sale was a nice selection of Martin Brothers stoneware, as well as a diverse selection of ceramics and glass. 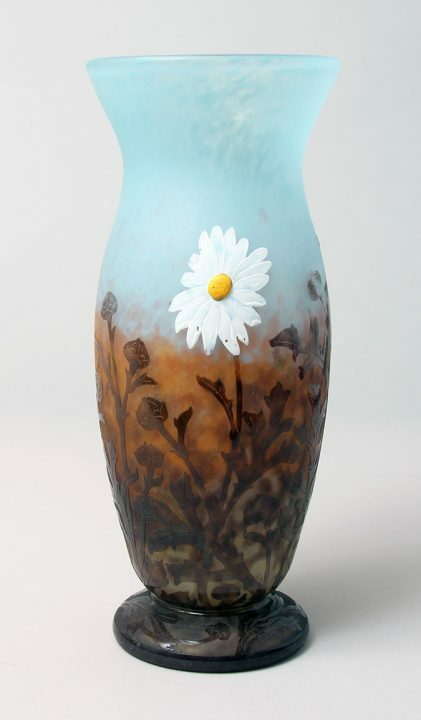 The top lot of the sale was a tall (16″) Martin Brothers stoneware bird tobacco jar. Estimated to sell for $40,000 – $60,000, it realized the low estimate of $40,000 + buyer’s premium = $50,000. My opinion is that it would have sold for more if it had had more character. 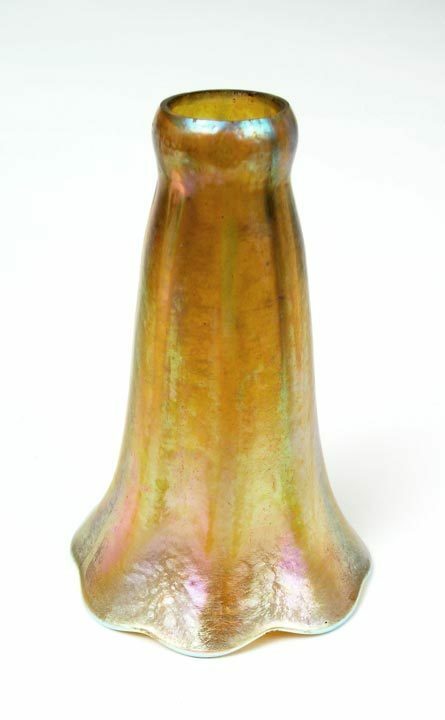 A George Ohr vase, lot #48, took second place with an attractive double-sectioned vase, 6¼” tall. It sold for many times its high estimate of $9,000, realizing $46,875, including buyer’s premium. 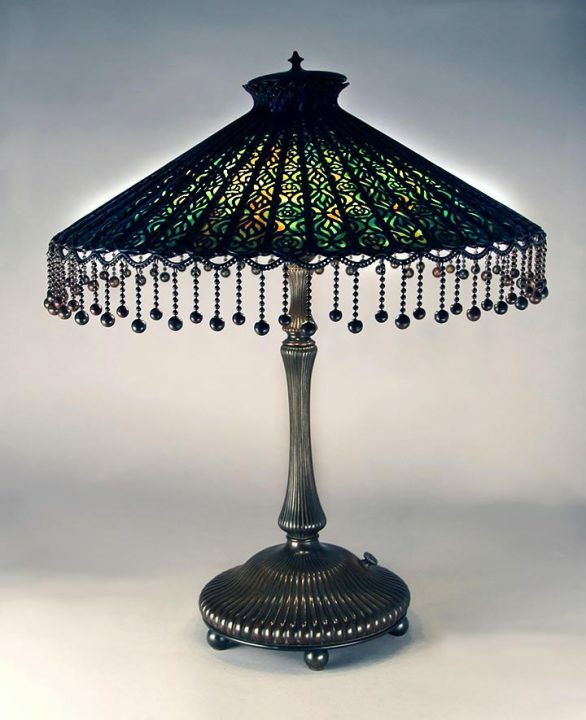 The selection of Tiffany Studios lamps and glass was limited. 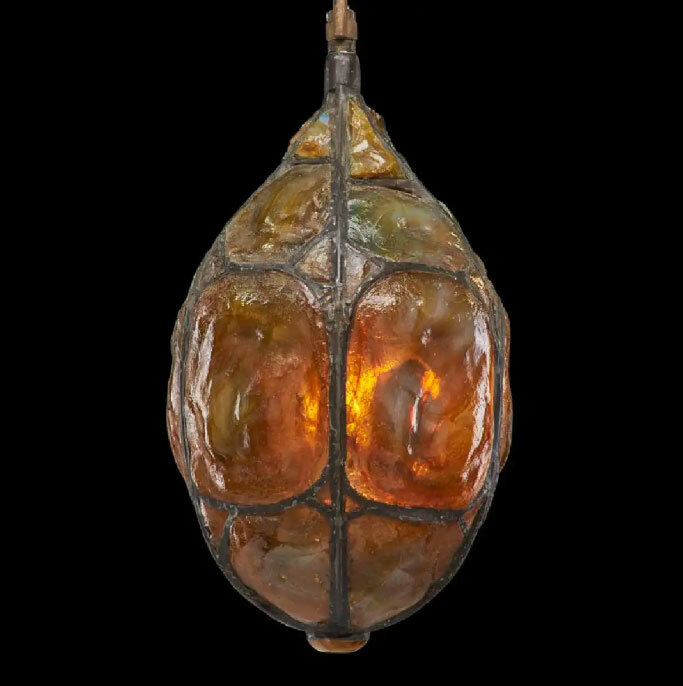 Lot #391, a Turtleback hall lantern, performed best among this group. It sold slightly above its high estimate of $20,000, realizing $26,250, including buyer’s premium. Personally I thought it was awful and wouldn’t have bought it at any price, but the bidders did not ask me first. How’s that possible? What a difference a year makes. By the end of the first day last year we had big smiles on our faces. This year we had frowns. A lot of the key players were missing this year, for one reason or another, so the first day was a downer. We made a couple of sales, but nothing important. Saturday was a lot like last year. The attendees were a lot less knowledgeable than on Friday, so many of the questions were naive. We answered them as patiently as we could. One woman purchased her first ever Daum Nancy vase without even knowing the first thing about French cameo glass or Daum or me. She just liked it. That was brave of her and a lovely surprise for me. I’m happy to say she chose well and will be very happy with her purchase. 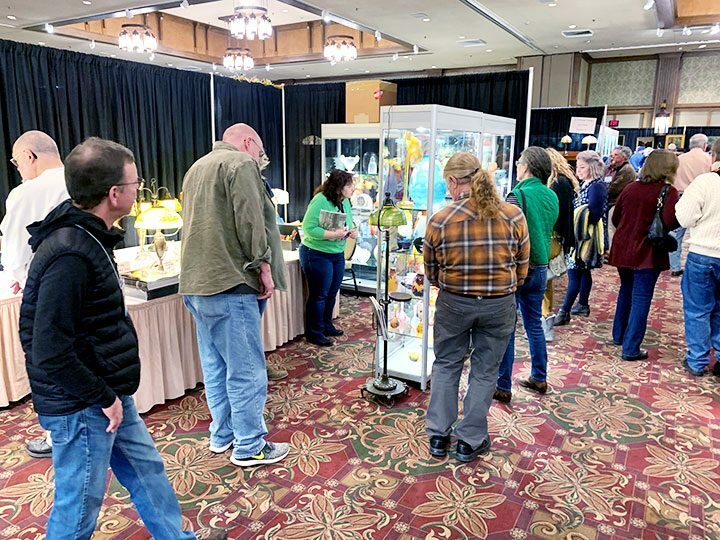 The 32nd National Arts & Crafts Conference, at the Omni Grove Park Inn in Asheville, NC, will open to the public this Friday, February 15th, at 1 PM, and continue until Sunday, February 17th, at 4 PM. I wish all antique shows had the vibe of this one. It’s warm and inviting, with enthusiastic buyers, most of whom travel from afar. It’s all contained in the Grove Park Inn itself, a wonderful 1913 masterpiece of a hotel. Picture a line of rocking chairs, in front of a gigantic boulder fireplace, with wood crackling in the fire, in a cavernous Arts & Crafts lobby, guests rocking leisurely, chatting, with a glass of wine. Lovely, no? We sold many lamps in Miami Beach, so we restocked for Grove Park. 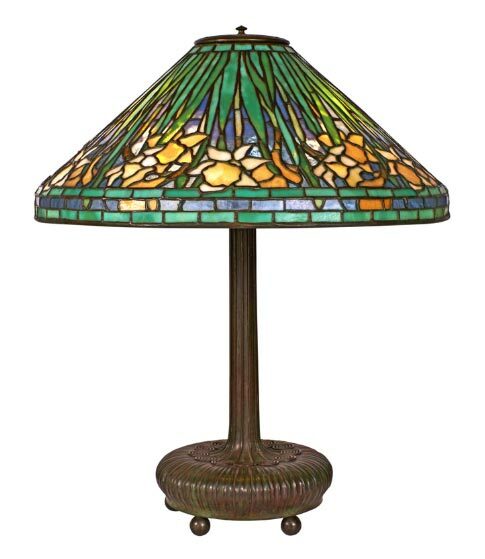 Mainly we added several Tiffany Studios geometric table lamps. Arts & Crafts collectors prefer geometric designs over floral designs to complement their interiors. We’ll have two Acorns, one Lemon Leaf and one Tyler Scroll, in addition to several florals. If you’ve never visited the Grove Park Inn, you’ll want to come during this show. I promise you’ll thank me! 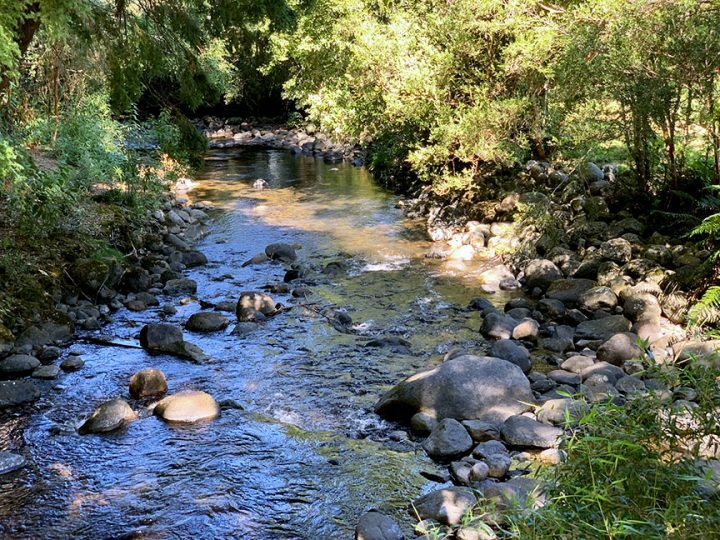 We are on vacation next week, so no new post for the week of February 4, 2019. The Original Miami Beach Antiques Show ended yesterday after a 4-day run that started this past Saturday. I, for one, am extremely pleased. 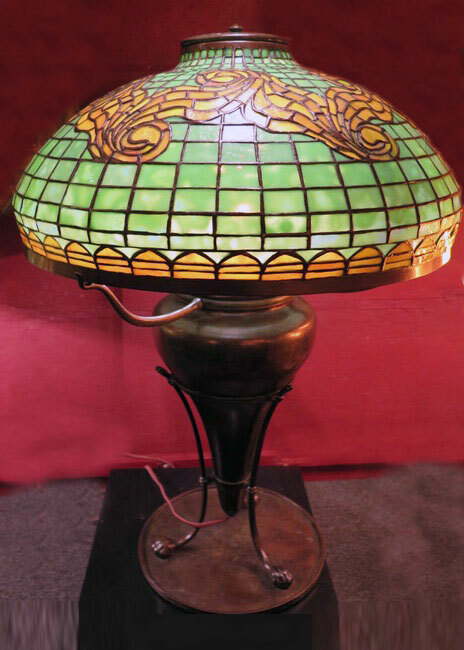 After selling six Tiffany lamps on Sunday, I sold another Tiffany lamp and a Handel lamp on Monday, for a total of eight lamps. I’m pretty sure that’s a personal record. And we didn’t just sell lamps. We sold glass, bronze, porcelain and etchings. Amazingly, most of the sales were to new buyers, including some who weren’t senior citizens. That was quite refreshing. 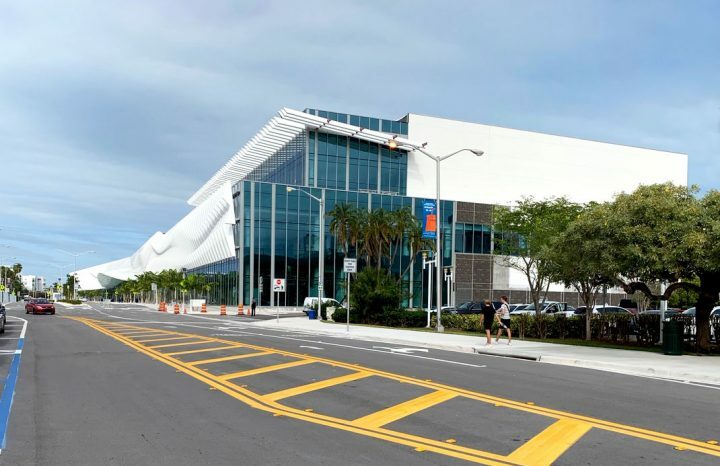 The return to the Miami Beach Convention Center was well received. Attendance was excellent every day (except Tuesday, the last day), after very slow starts each morning (except opening day). We made no sales on Tuesday, but still finished with a superb show. We’re looking forward to next year’s show, but are concerned about the effects of the very early dates in January. 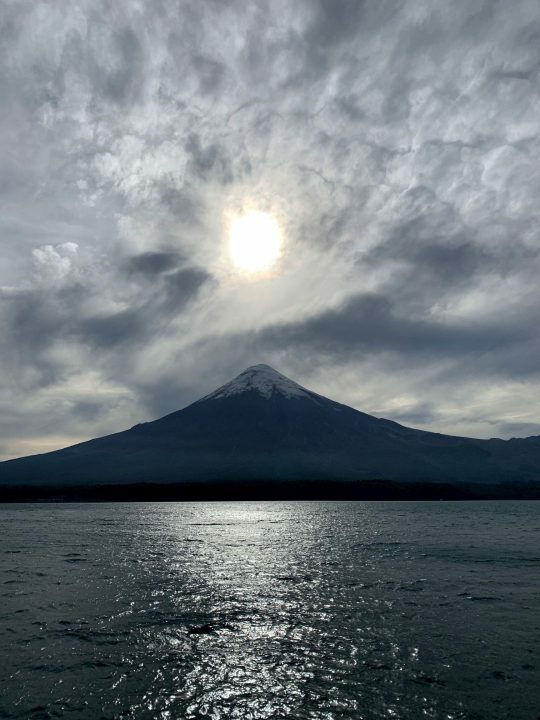 Right now, the show is scheduled to open on Sunday, January 5, 2020, with a possible opening on Saturday, January 4, at 3 PM. It would be a huge mistake not to open for a full day on Saturday, so I hope management will come to their senses and realize the importance. 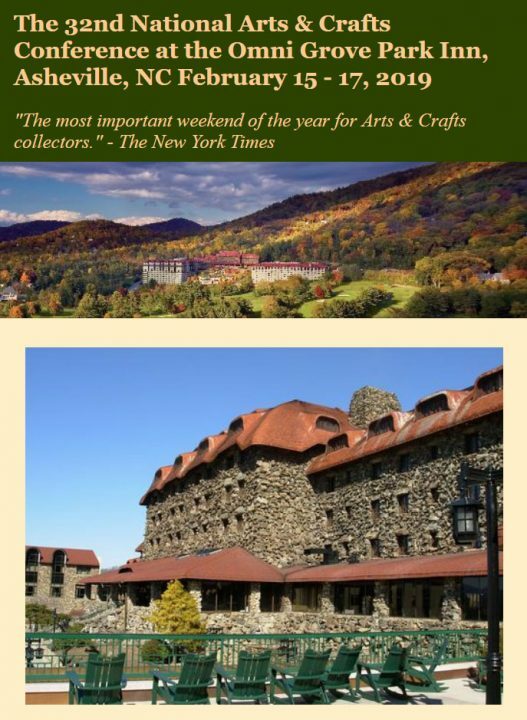 Now we’re off for a couple of weeks of R&R before we head to Asheville, NC for our favorite show of the year, The 32nd National Arts & Crafts Conference at the Omni Grove Park Inn in Asheville, NC, February 15-17, 2019. If you’ve never been to this show, make plans NOW. You’ll thank me.